Leaving the slippery mud of Alton Water behind, the Finn fleet headed south to the darker, more viscous variety of mud found in the silt lined Chichester Harbour. Those who arrived on Friday were greeted by rain and the start of a cold northerly, but by Saturday morning, the sun occasionally peeped out and there was a moderate north or north easterly breeze. 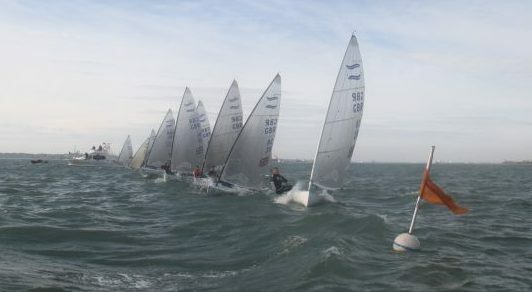 Tea and bacon butties were thoroughly enjoyed, whilst the race officer asked that we leave the Hayling bar inshore, and aim to arrive promptly to facilitate smooth race management. It seemed only fitting that we launched late and ignored navigational advice on the way back in later in the day. The committee boat kept its end of the bargain by also being late to the race area. It wasn’t long before the AP was down, outer layers shed by a few brave souls and plans made for the first beat. The tide pushing up meant that the fleet were poorly behaved once, but with the threat of a black flag we were off second time lucky. 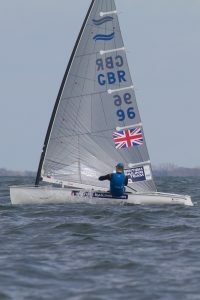 The Under 23 sailors, Matthew Stephens and Cameron Tweedle started well at the pin end and worked hard on the left hand side to be near to Allen Burrell who once again showed his masterful upwind speed. The added chop just seemed to make him go faster as he found a nice right hander to come back into the windward mark in the lead, chased by Matthew, Cameron, and Colin Leonard. Allen took no nonsense and one to one pumped to a handy lead down the second run, whilst Hector Simpson charged low on both reaches to demonstrate his comeback skills! Allen stayed clear, whilst Matthew stayed second avoiding Hectors clutches who came in third. 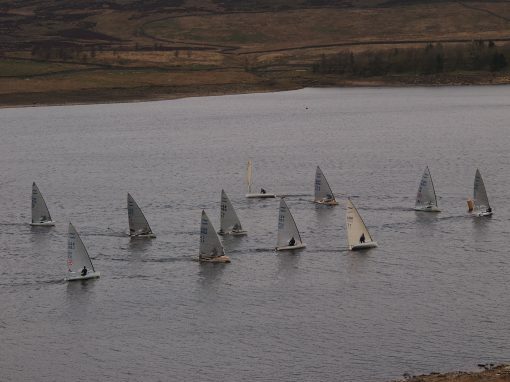 The excellent race management team got the second race underway promptly, and the same shifty conditions meant that the leaders came from those who made the best choice on when to come back across the course. Hector dominated downwind as he and Allen stretched away, and Cameron showed good speed and awareness to roll Colin up the last beat. 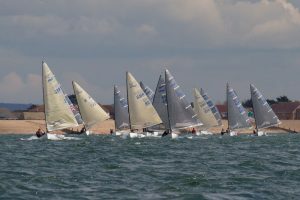 There were some fairly big shifts in between race two and three but shortly after the start the change of tide allowed Colin and Cy Grisley to lift up to the mark with many sailors stuck on the outside of the shift (Hector) and many more having to reach down from up tide to the mark. Colin slipped away to lead until the mid point of the second beat, when pressure came from the left but heralded a right shift. Hectors pace meant he came through to another clear win, whilst Allen finished third. A long cold sail in was quickly washed from the memory as Mengeham provided excellent pasta and sauce to aid the recovery of weary limbs after the days tricky upwind and downwind pumping conditions. Sunday morning dawned after the previous nights curry, sunny and blustery, but as the fleet arrived enthusiasm was low. It was grey, dank, and the Chimet buoy was suggesting 25 knot gusts to add to the already cold conditions. Tea and bacon butties again saved the day, but the highlight of the slow start was the Finn class attitude. 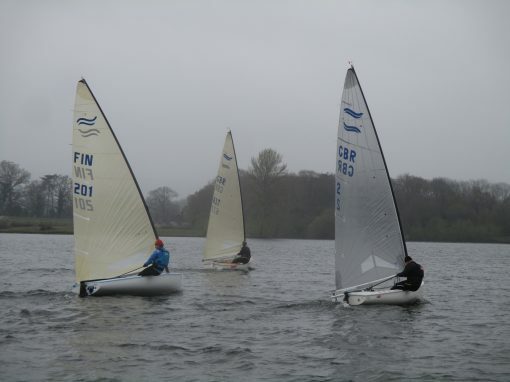 Beginners received tips on settings from Hector, the fleet rallied round Matthew who unfortunately had gear issues that resulted in him not sailing on Sunday, and lots of tips and tricks were passed from old to young, and experienced to novice. Surely one of the biggest beneficiaries was Simon Green who was lifted to mid fleet and can look forward to continued improvements as he heads to Garda for his first Masters worlds. 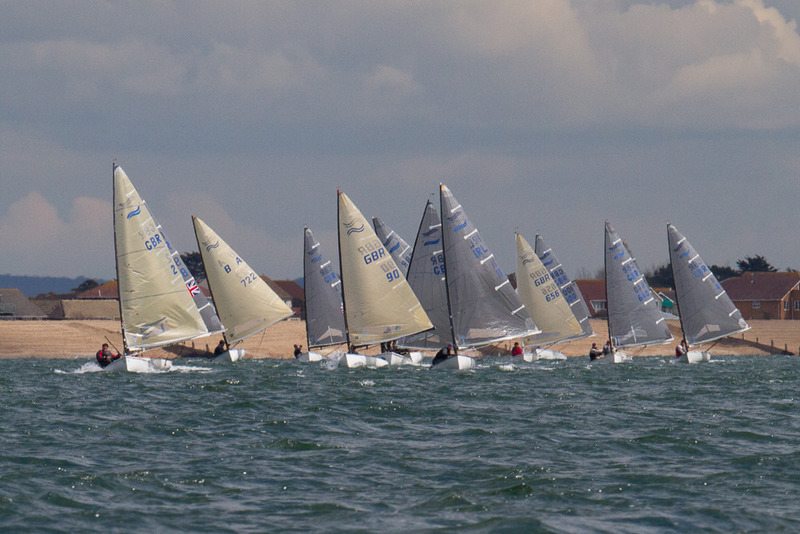 Thankfully the breeze subsided and again we had an enjoyable and at times thoroughly warm and sunny broad reach to the race area and enjoyed at first a moderate breeze, which eased as the day progressed but left behind cloud and thermal driven puffs from many angles. All the better to confuse the sailors! The first start was straight to black flag, and Colin and Sander must have been having a medical conference mid-line as they sailed over early. The beat was tricky, but from a far, I saw Cameron Tweedle sailing fast but not fast enough to hold off Hector and Kristian Sjoberg who continues to show his all round tactical strength. Simon Moss made a foray to the top 5, and Mike de Courcy continued to show that you can organise an event and still do well by being there or there abouts every race. Colin, every keen to show off pumped up to the back of the lead pack down the last run, but couldn’t save it when a gust came from the left and flipped him into windward. At least everyone saw, and it was a worthy winner of the capsize prize! John Heyes didn’t even know Colin capsized on the sail out on Saturday. 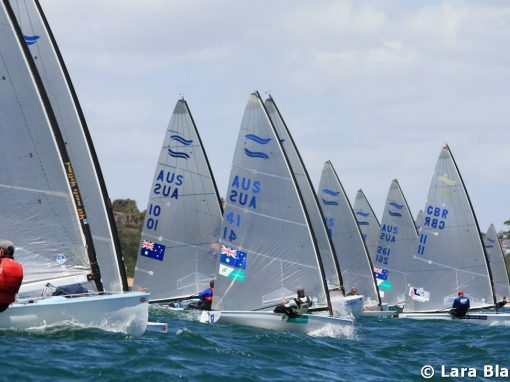 The second race again had tricky upwind and downwind conditions, and rounding the windward mark deep in the fleet, Hector was heard to say “race win still on,” as he scythed his way through the pack to lead at the next windward mark. It’s not arrogance if it’s true! Kristian and Mike had good races in third and fourth but we all wished we had followed Richard Sharp to the right hand corner on the second beat. He came in on great pressure and great angle to finish second. 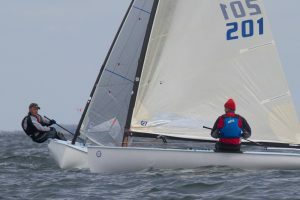 In the day’s racing Marcus Bettum was also moving up the fleet when he took sixth. The dropping breeze meant that free pumping wasn’t on the menu in the third race, but Hector, Colin and Cameron led round the mark. Hector took the first puff and was able to get away for another race win, but Cameron and Colin had to take what they’d got and use the light breeze to gybe onto port. The fleet, led by Allen headed right in the pressure that was arriving and sailed round those on the left, despite the tidal disadvantages of being right. Cameron pipped Allen up the last beat, but it was not enough and Hector took the overall silverware, followed by Allen and Cameron. 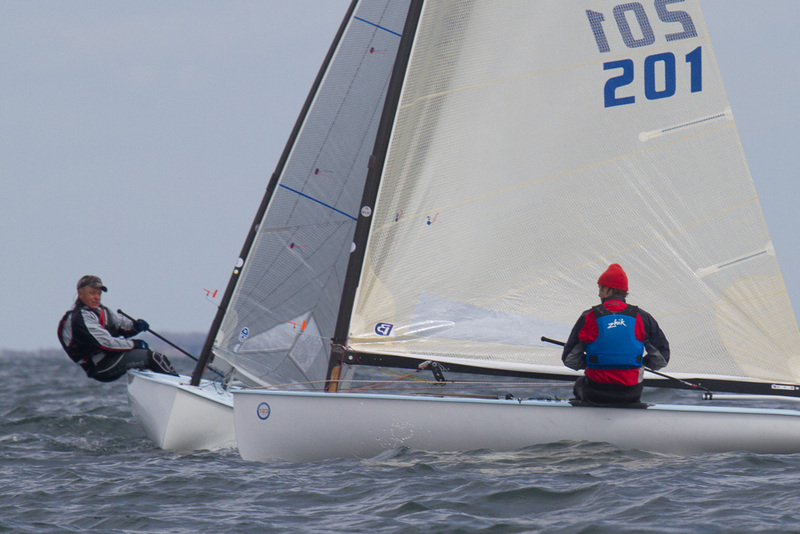 Mike de Courcy and Kristian had good second days to close out the top five. Fantastic prizes were awarded thanks to Hawk Marine, Suntouched Sailboats and Mengeham Rythe Sailing Club. Well that’s another event done, good luck to all those headed for Garda, Gaeta and Aarhus. Race hard, and good luck!